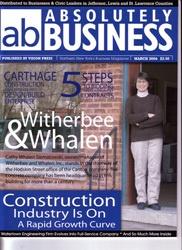 Witherbee & Whalen, Inc. is proud of our involvement with our North Country Community projects. 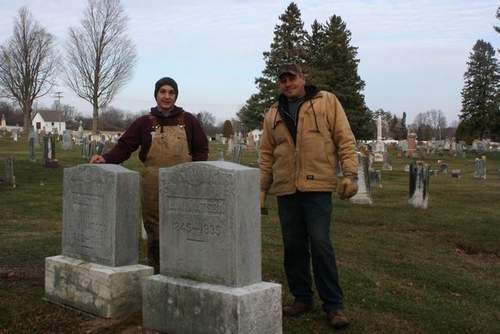 The Russell Cemetery restoration is a great example of our collaboration with local communities. 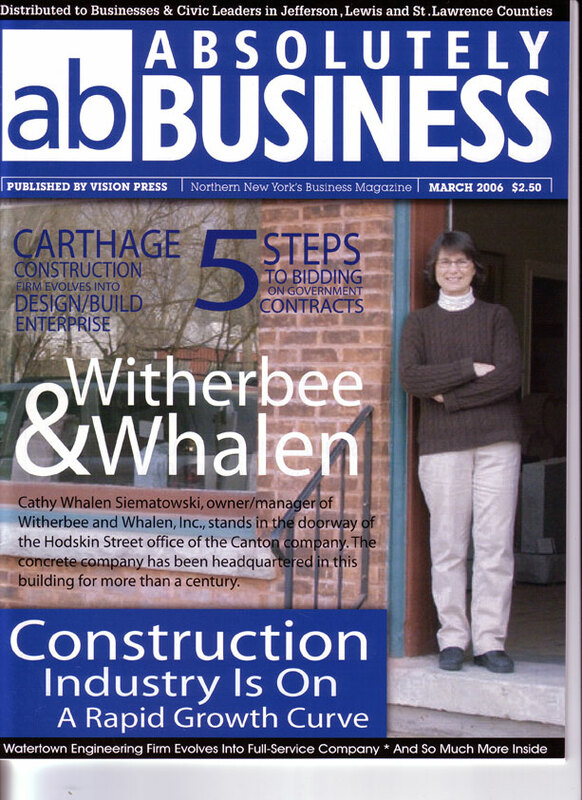 Witherbee & Whalen, Inc. was featured on the cover of the March, 2006 publication, Absolutely Business, a magazine distributed to businesses and civic leaders in Jefferson, Lewis and St. Lawrence Counties. The article, written by Wil Hansen, is subtitled, Two Sisters Run Concrete Business: Attention to detail, personalized service and community involvement has helped concrete business thrive for more than a century. Click the photo of the cover for a larger view. We donate both our time and talents to various community projects and groups. Art students from a local high school pose with pieces of Potsdam Sandstone ready to try their hand at layout and sandblasting. 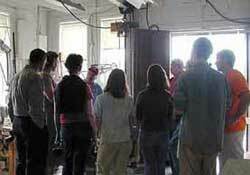 High school art students listened to George Ladison explain the finer points of monument making. 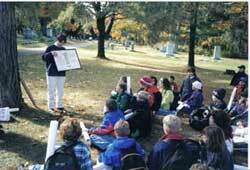 Roberta Whalen Yaeger shows an interested group of 4th graders the original 1925 purchase order for Irving Bacheller's memorial. Irving Bacheller was a local author, well known throughout the North Country. Roberta explains to the students how rubbing paper works and demonstrates how a rubbing is taken. She uses a crisp dollar bill. Tradition says, a crisp dollar bill will make the best impression. Can you spot the dollar bill? 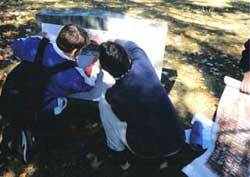 After learning about Irving Bacheller and his memorial, the students try their hands at taking their own rubbings. 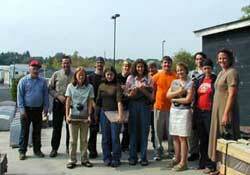 Shown here are students from SUNY Canton's Mortuary Science Program a few years ago. 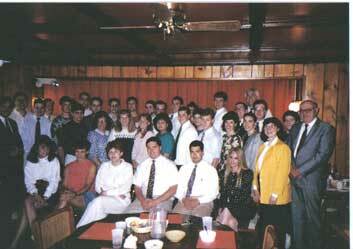 Many of these students now work in funeral homes in the North Country. 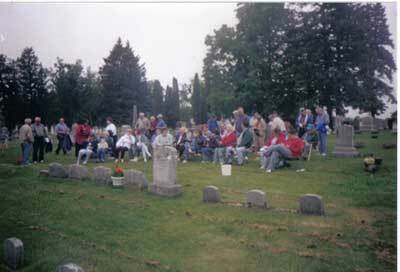 It was a perfect day (overcast) and a good turnout for this cleaning seminar at a local cemetery. Ever go to a fire department chicken bar-b-que and wonder about that big concrete box with the grate on top that they cook all that chicken on? It is the bottom half of a concrete septic tank, a new one of course! Witherbee & Whalen, Inc. has donated "chicken bar-b-ques" to almost every fire department in the North Country.